Dec 1st -2018- The official start of Operation Santa. 2018 was a special year for our kids. Over the last several months, we’ve been getting ready for our trip to the North Pole. United Airlines invited 25 of our kids, all children of our combat wounded vets, for a very special ride to go meet Santa. Over the last 25 years, United Airlines has been taking children to the North Pole via Fantasy Flight. It’s an amazing trip put on by amazing people. 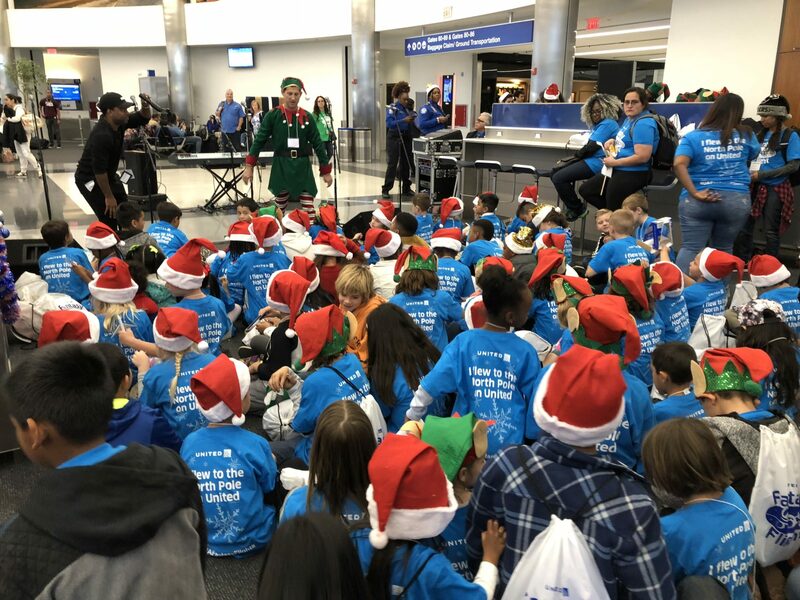 The United Airlines pilots, ground crew, and a slew of volunteers take kids for an incredible trip to the North Pole to see where Mr. and Mrs. Claus live. United Airlines brings more than 100 children on every North Pole trip, and this year 25 of our kids were invited. Needless to say, we at WHOA were thrilled to kick off our Operation Santa by having some of our kids go on an“actual trip” to the North Pole. But first, we had to take an hour-long magic plane ride, and it could only be magic considering how far away the top of the world is. The staging area was the Marriott Hotel in Hawthorne, CA, home of Space X and other aero-space pioneers. Hawthorne was an appropriate staging point since our kids needed to be close to LAX. There, they could rest up, get a good night’s sleep, and prepare for the trip of a lifetime early the next morning. Everyone met at a secret United Airlines facility, where we got to meet the crew. They were dressed as princesses and elves, and specially trained pilots known as Santa’s Special Forces. They were good.They dressed a little funny, but they were very good at their jobs. Enroute, they slowed down enough to allow some passengers from a Magic Carpet board the plane and pass out gifts to all the kids.Then they jumped off the plane and back on to their Magic Carpet and flew away. It was tricky, but both pilots flawlessly executed the very dangerous maneuver. What pros. Amazingly enough,we were greeted upon arrival by hundreds of Santa’s helpers. We were then taken to Santa’s special playground for good kids, and there we met Santa and Mrs. Claus. We played all afternoon and had a great time at the North Pole. And then, by another stroke of magic, we were transported right back to the same secret United Airlines location, where anxious parents waited to see their kids arrive safe and sound. All in all, the kids were bussed to the airport, ticketed, taken through security just like everyone else, and then went to the North Pole without their parents. It was a blast. The kids loved it, and the parents seemed as excited as we were at WHOA. Our trip to the North Pole was exactly that: a TRIP! Congratulations to United Airlines for having the creativity and means to do this. And on behalf of those we serve, we’d like to say thank you, United Airlines; we really enjoyed it. The day after our trip to the North Pole, the office was buzzing with helpers wrapping presents and shipping them off to our out-of-state kids. Get involved. Make a donation. where you can drop off unwrapped gift that will surely put a smile on some child’s face this Christmas. Soon, Santa will don his red suit and start making house calls, in the hopes of spreading Christmas cheer to the children of our Combat Wounded Veterans.